Made from a newly developed material, extra soft and very resistant to wear, these protector pads are perfect for hotels, motels, hostels, inns, B&Bs, day cares, unexpected visits from friends, and now for mobile homes or camper van beds. 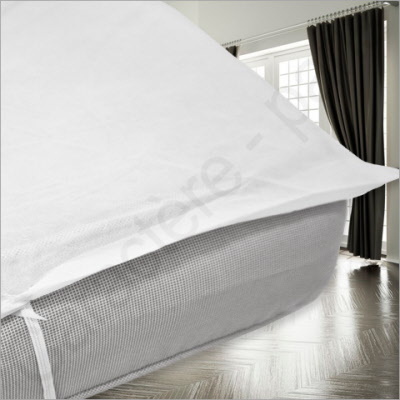 The hypo-allergenic fabric helps prevent the spread of lice, bedbugs, bacteria and dust mites, as well as prolonging the life of the mattress. if they do, the period of usefulness will obviously depend on issues of cleanliness and hygiene. After use the protector pads can be thrown away or recycled. These protector pads fasten to the mattress via elastic straps - refer to the diagram for more information - and are non-waterproof. We also provide waterproof sheets available in the same dimensions if required; for the best possible protection, choose our fitted waterproof sheet. Nous proposons également des protection étanches de cette dimension. Pour les trouver visitez notre boutique et cherchez les alaises.